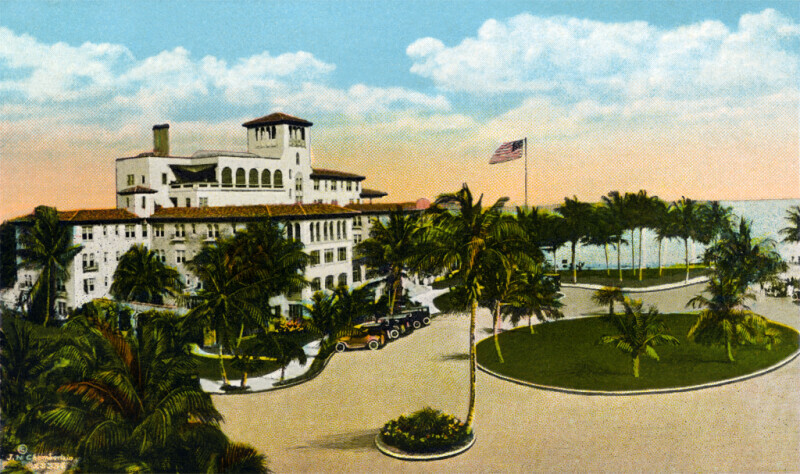 This scene shows the Pancoast Hotel, at the end of 29th Street in Miami Beach, Miami. The hotel is faced with white stucco, and the roof is covered with terracotta tiles. The building is a total of six stories high, although the top two stories are smaller. There is a covered observation platform, on the roof. There is a circular driveway in front of the building, and several cars are parked there, at an angle to the curb. The Atlantic Ocean can be seen in the distance. The grounds are landscaped, and there are many palm trees. WARNING: You are about to download a 14.1 MB TIFF!